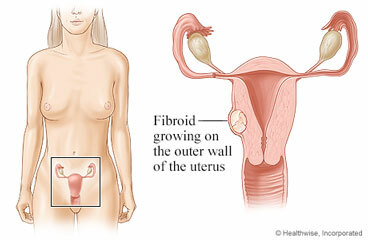 A myomectomy is surgery to remove fibroids from the uterus. Uterine fibroids are benign (non-cancerous) tumours of the uterine wall or muscle. The surgery is done through a cut (incision) the doctor makes in your lower belly. In many cases, the doctor makes the incision just above the pubic hairline. In other cases, the incision runs from the belly button to the pubic hairline. Either incision leaves a scar, which usually fades with time. Most women go home 1 to 4 days after the surgery. You can expect to feel better each day, but you will probably need about 4 to 6 weeks to fully recover. This surgery should decrease the pain and heavy bleeding that are caused by fibroids. You will still have your uterus after the surgery. Having a myomectomy, unlike many other treatments for fibroids, means you probably will be able to have children. But some surgeries for large fibroids may damage the uterus. This can make a future pregnancy more difficult or risky. Talk to your doctor about this as you prepare for your surgery. The surgery will take about 2 hours. Enter N015 in the search box to learn more about "Abdominal Myomectomy: Before Your Surgery".